Frequent visitors to the GoWizardry website know that I feel very fortunate to have had access to superior study material for many years. That comes from the hundreds of copies of Kido magazine that I have collected over the years. What is so great about these magazines is that they were published by and for professional players. Therefore, the articles always covered high level topics. They were sometimes difficult, but I enjoyed the challenge. The players who produced these articles were a diverse group. Naturally, top tournament professionals were perennially represented, but there were also lesser well-known players who were given space. That made for a wide variety of perspectives on display. 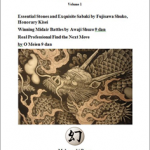 Kojima Takaho 9 dan (born January 26, 1942) published a series of articles in 1998. 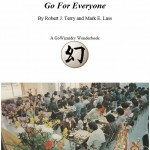 For foreign go players, this is not a familiar name, but he is the nephew of the late Fujisawa Hosai 9 dan (March 5, 1919~August 2, 1992), who was the first player to win advancement to the rank of 9 dan at the Nihon Ki-in (Japanese Go Association). He was also Kojima’s mentor [sensei] and the one who trained him. Consequently, Kojima’s pedigree is impeccable. For the past several weeks the material featured here has been a bit complex and difficult, so this time basic technique analyzed simply and clearly is offered. Incidentally, the title of this article includes the word suji (筋) — in the article the actual word used is kiki-suji (利き筋), which means "forcing line," and the "kiki" kanji is the same one used for "kikashi," or forcing move. I have translated suji as "technique," but it is a common word in Japanese that can refer to the lines in a person’s hand, a storyline, fiber, string and many other meanings. So there is a depth of nuance that cannot be conveyed with one word in English. This is one of the reasons that reading material in Japanese is so attractive to me. By Kojima Takaho 9 dan. Cutting with Black 1 and 3 is considerably forceful, if not high-handed. How should this be countered? Please understand that playing an atari with White A, which some players are inclined to do, is out of the question. 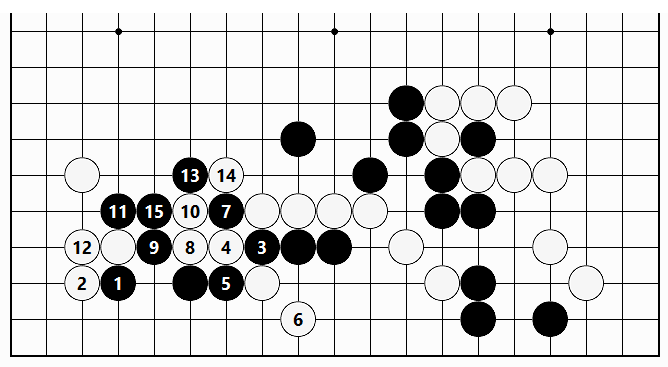 First, White 1 is the effective technique [suji]. Black is forced to defend at 2, so by gaining momentum in this way, White can lean [motare] on Black with 3 and 5. Next, White aims at making the fencing-in move at "a," and therefore has sufficient scope for fighting. 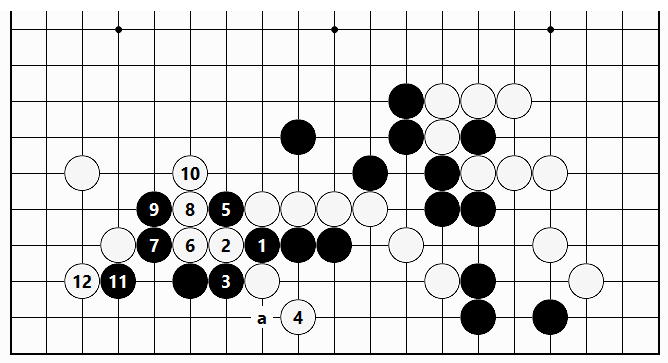 If Black replies at 2 (or else Black "a"), White attaches with 3, and one way or another will handle the position [sabaki] adroitly. Both sides have made cuts in the center, making for a perilous fight. If Black’s forcing move on the lower side, which absolutely has to be answered, can be found, using them will allow Black to gain a solid advantage. Black 1 initiates a wrapping up sequence. The fencing-in move of Black 3 wraps White up, and fixing the shape is a common method that is enjoyable to play, but in this case White answers in a straightforward manner with the moves through 8. Next, since the cutting points at "a" and "b" remain, this is not good enough for Black. Without fixing any shape, the shoulder hit of Black 1 has a depth of nuance that should be savored. White 2 is the real move [honte] here. 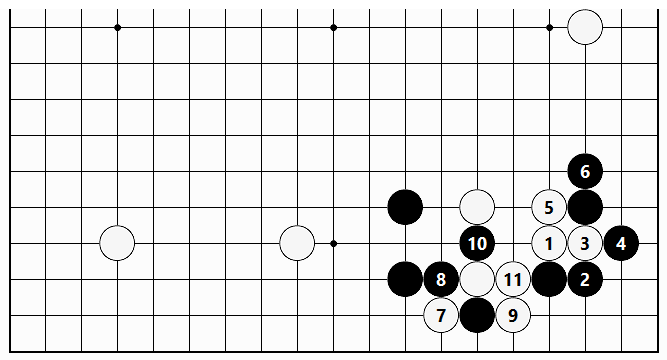 Black 3 cuts off White’s stone on the lower side, giving a sufficient result. 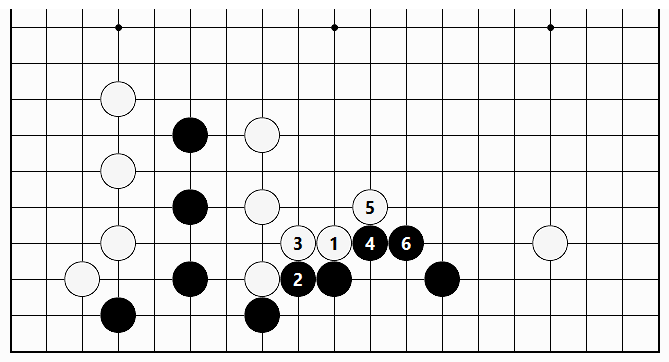 Should White respond at 2, it is just then that the Black squeeze with 3 and the following moves works perfectly. This gives Black impetus to play at 7, whereupon White will find it difficult to deal with the situation. In the midst of this sequence, if White uses 4 to push out at 5, Black answers at "a," and on the contrary, White is only helping Black. The question is the strategy to adopt to deal with White’s marked stone. Immediately pushing through with Black 1 and cutting with 3 is met by White capturing Black’s stones with 4 (or else "a"), but Black can seek impetus for making good form by playing 5. This is one course of play, but incurring a loss before going into action falls a bit short. Simply playing Black 1 is elegant. This is exchanged for White 2, then Black fixes the shape with 3 and the following moves. Squeezing with Black 11 and 13 to fix the shape is a big difference from Diagram 1. 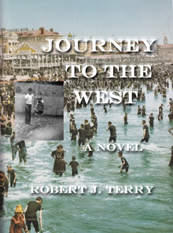 …the sequence through Black 8 is unavoidable. This can be considered handling the situation [sabaki] on a large scale. 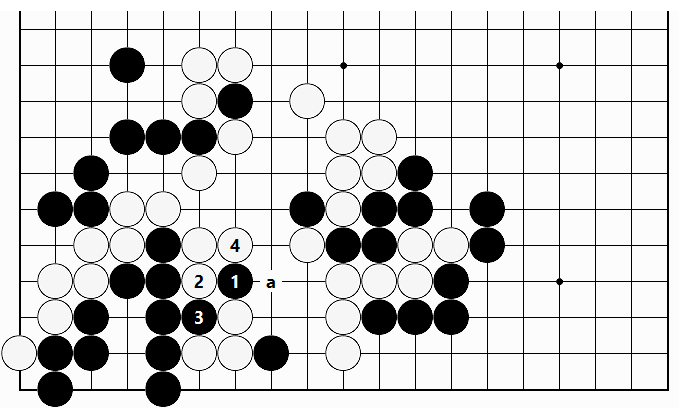 Diagram 3 is painful for White, so in this diagram is the real game play. 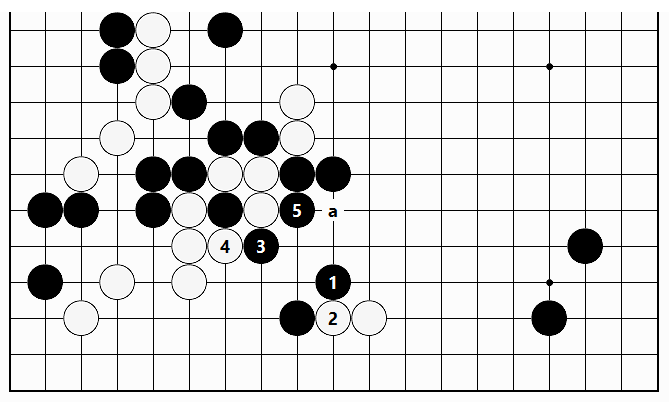 Black earns a sufficient division here. This is an endgame playing method. 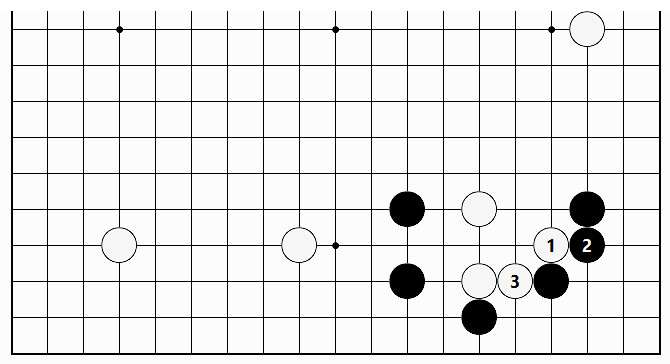 In response to Black 1, White plays 2, but how is White’s tenaciously hanging tough by making bad potential in the shape ["bad aji"] to be judged? Please look for the effective technique [suji] that enables Black to take profit. 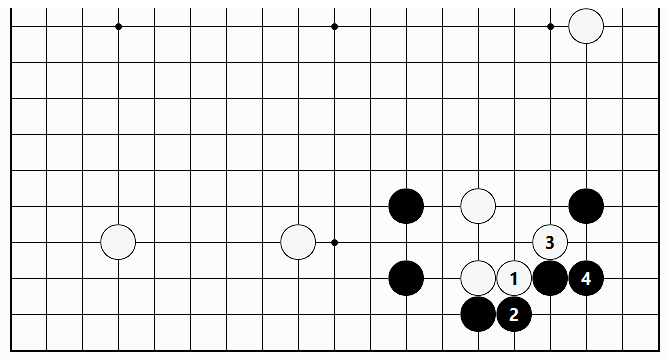 In the actual game, White gave way by playing 2 at A. Instead of fixing the shape in any of the various ways available, Black keeps the possible forcing moves in mind, and makes the strong attachment of 1 at the vital point. This puts White on the spot to find a response. Should White play at 2, Black 3 aims at next cutting with Black "a," or playing atari at either "b" or "c." These are equivalent options. 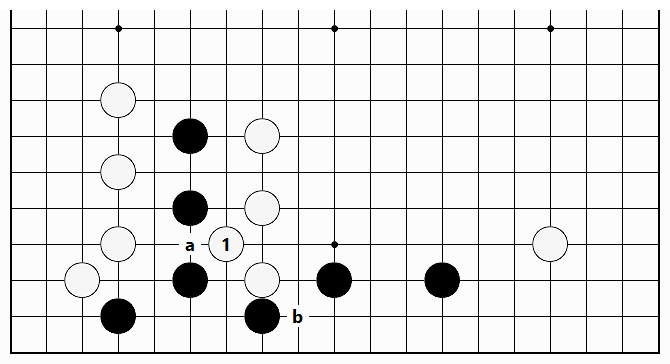 Besides that, if White responds by playing 2 as White "d," in the same way, Black 3 causes White problems. Other than that, White "c" is stymied by Black 2. In whatever case, there are holes in White’s shape. 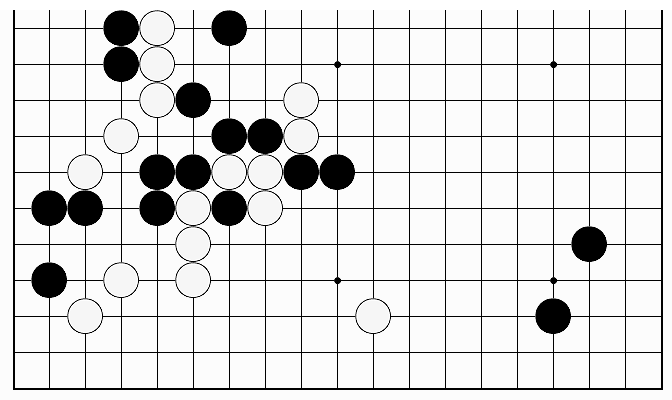 That is why in the actual game it was unavoidable for White to make the concession of playing at A (in the Theme Diagram). 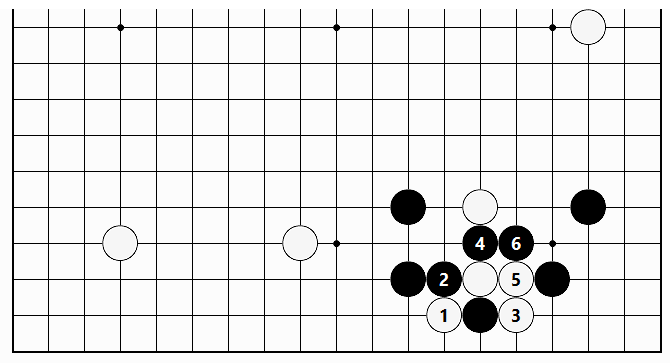 At first glance, Black 1 might look like tesuji, but White 2 and 4 make the move misfire. 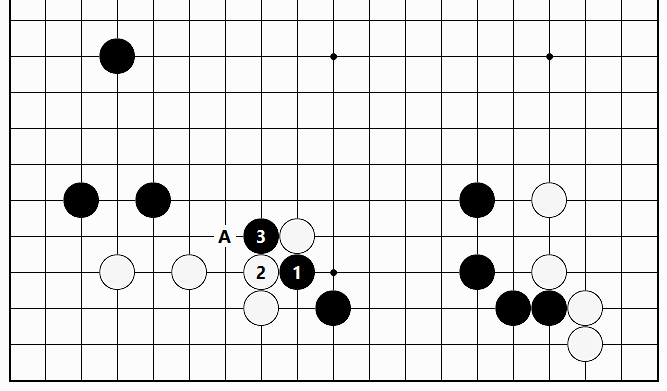 And even if Black plays 3 at 4, White "a" ensures that nothing harmful happens. It is well known by everyone that the attachment of the marked Black stone is a tesuji for connecting underneath. However, in this position, it is a thin and weak move. How is the connection underneath to be prevented? This is another demonstration of the practical use of an effective technique [suji]. If White attempts to put up resistance directly with 1, the sequence through Black is in accordance with Black’s plan. Playing White 1 at 3 would lead to a similar result. White 1 and 3 are crude moves. The sequence through Black 4 does not set the stage for any significant result, not even the ghost of one. This just helps Black to deal with potential problems ["bad aji"]. As the previous example showed, it is sometimes best not to fix the shape in any way. Simply attaching with White 1 is a good move. 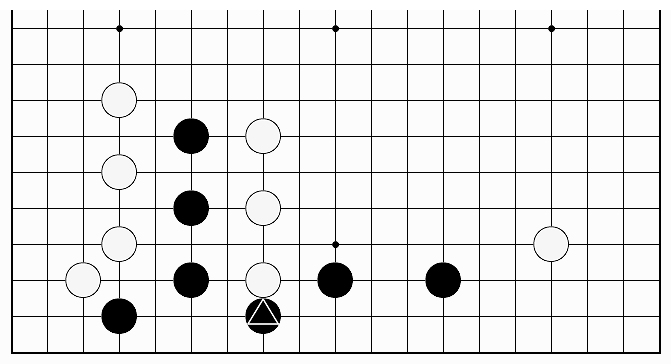 Should Black answer at 2, White 3 prevents the connection underneath. 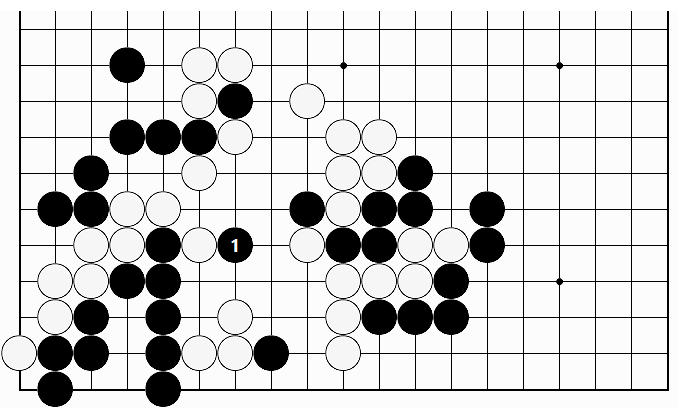 Even if Black gives way with 2, White can make the forcing moves of 3 and 5 in sente. White can then make the decisive move of 7, neatly frustrating Black’s plan. This is an easy problem based on the practical application of analysis under investigation here. 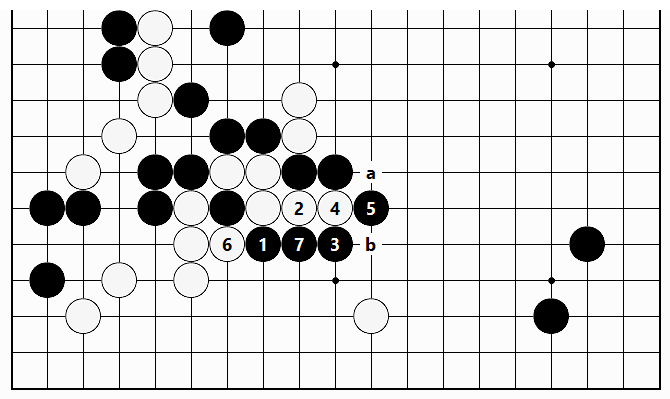 As in the previous example, the strategy of the marked Black stone aims at connecting underneath. However, it is plain to see that this move is thin and weak. In this case, there is a playing method to rebuke Black’s play. 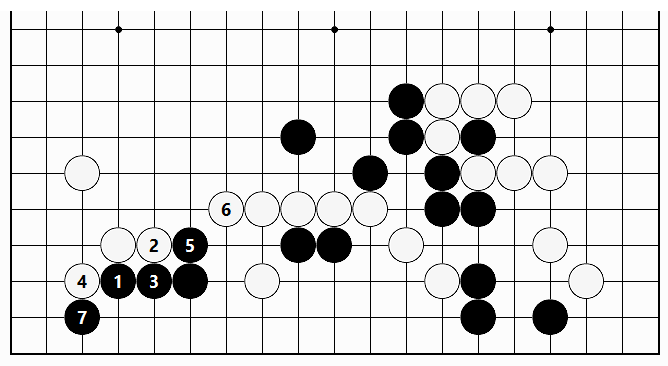 The attachment of White 1 is often a stylish tesuji played in good form, but this time it does not work well after Black replies at 2. Black emerges triumphant after the move at 6. 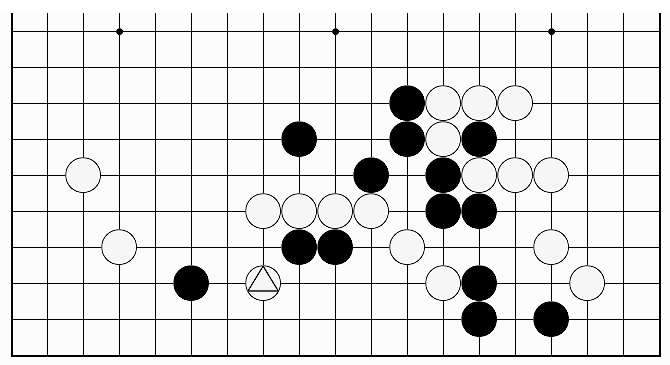 The simple, not to say artless, move of White 1 is the correct solution. 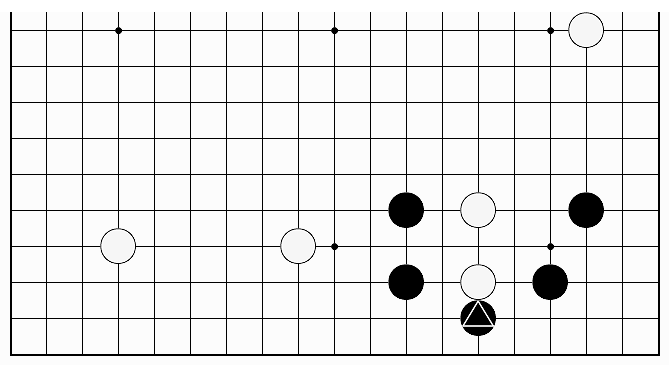 Next, cutting Black’s stones apart with White "a" and the hane over Black’s stone with White "b" are equivalent options. This puts Black on the spot.